Economists have searched for the mythical balance between the cost of climate action, and the future cost of doing nothing. As delegates at the UN climate summit in Katowice, Poland, discuss the possibility of restraining global warming to 1.5℃, it might sound like a reasonable question to ask how much money it will cost if they fail. Economists have spent the past 25 years trying – and largely failing – to agree on the “right” answer to this question. It’s an important consideration, because governments are understandably keen to balance the benefits of limiting long-term climate damage with the more immediate costs of reducing greenhouse emissions. In simple economics terms, we can ask what price would be worth paying today to avoid emitting a tonne of carbon dioxide, given the future damage costs that would avoid. This mythical figure has been called the “social cost of carbon”, and it could serve as a valuable guide rail for policies such as carbon taxes or fuel efficiency standards. But my recent research suggests this figure is simply too complicated to calculate with confidence, and we should stop waiting for an answer and just get on with it. While some climate economists have put the social cost of carbon at hundreds or even thousands of dollars per tonne of CO₂, one of the most influential analyses, by Yale University economist William Nordhaus, offers a much more modest figure of just over US$30. Nordhaus won this year’s Nobel Prize in Economics, but his analysis has some uncomfortable conclusions for those familiar with the science. At this level, it will be economically “optimal” for the world to reduce its CO₂ emissions quite slowly, so that global warming peaks at about 4℃ some time next century. But this certainly doesn’t sound optimal from a scientific perspective. Reconstructed global mean temperature anomalies for 0–2000 CE, and DICE-2016R projections for 2015–2400. Calculating this magical economic balancing point is the holy grail of climate economics, and sadly it also seems to be an impossible task, because the question is so complex as to be unanswerable. But we can’t do a simple experiment to assess the global effects of CO₂ emissions, so instead climatologists have to fall back on the second or third options. They can compare today’s conditions with previous fluctuations in atmospheric CO₂ to gauge the likely effects. They also design models to forecast future conditions on the basis of known physical principles. Unlike the immutable laws of physics, the laws of economics depend on markets, which in turn rely on trust. This trust could break down in some catastrophic future drought or deluge. So economists’ various rival calculations for the social costs of carbon are all based on unavoidable guesswork about the value of damage from unprecedented future warming. One reason why economists keep trying to value climate damage is a 1993 US Presidential Executive Order that requires cost-of-carbon estimates for use in US regulations. But my findings support what many other climate economists have been doing anyway. That is to build models that ignore the future dollar cost of climate damage, and instead look at feasible, low-cost ways to cut emissions enough to hit physical targets, such as limiting global warming to 1.5℃ or 2℃, or reaching zero net emissions by 2100. Once we know these pathways, we don’t need to worry about the future cost of climate damage – all we need to ask is the cost of reducing emissions by a given amount, by a given deadline. Of course, these costs are still deeply uncertain, because they depend on future developments in renewable energy technologies, and all sorts of other economic factors. But they are not as fiendishly uncertain as trying to pin a dollar value on future climate damage. Focusing on the cost of emissions-reduction pathways allows researchers to put their effort into practical issues, such as how far and fast countries can shift to zero-emission electricity generation. Countries such as Sweden and the UK have already begun implementing this kind of action-oriented climate policies. While far from ideal, they are among the best-ranked major economies in the Climate Change Performance Index. Australia, by contrast, is ranked third worst. But aren’t trillion-dollar estimates of future warming damage, as featured in the recent US Fourth National Climate Assessment, necessary ammunition for advocates of climate action? Maybe, but it is still important to appreciate that these estimates are founded on a large chunk of guesswork. Setting climate targets will always be a political question as well as a scientific one. But it’s an undeniably sensible aim to keep climate within the narrow window that has sustained human civilisation for the past 11,000 years. With that window rapidly closing, it makes sense for policymakers just to focus on getting the best bang for their buck in cutting emissions. India’s Prime Minister Narendra Modi will today inaugurate the world’s largest statue, the Statue of Unity in Gujarat. At 182m tall (240m including the base), it is twice the height of the Statue of Liberty, and depicts India’s first deputy Prime Minister, Sardar Vallabhbhai Patel. The statue overlooks the Sardar Sarovar Dam on the Narmada River. Patel is often thought of as the inspiration for the dam, which came to international attention when the World Bank withdraw its support from the project in 1993 after a decade of environmental and humanitarian protests. It wasn’t until 2013 that the World Bank funded another large dam project. Like the dam, the statue has been condemned for its lack of environmental oversight, and its displacement of local Adivasi or indigenous people. The land on which the statue was built is an Adivasi sacred site that was taken forcibly from them. The Statue of Unity is part of a broader push by Modi’s Bharatiya Janata Party (BJP) to promote Patel as a symbol of Indian nationalism and free-market development. The statue’s website praises him for bringing the princely states into the Union of India and for being an early advocate of Indian free enterprise. The BJP’s promotion of Patel also serves to overshadow the legacy of his boss, India’s first prime minister, Jawaharlal Nehru. Nehru’s descendants head India’s most influential opposition party, the Indian National Congress. The statue was supposed to be built with both private and public money, but it attracted little private investment. In the end, the government of Gujarat paid for much of the statue’s US$416.67 million price tag. The statue under construction, January 2018. The Gujarat government claims its investment in the statue will promote tourism, and that tourism is “sustainable development”. The United Nations says that sustainable tourism increases environmental outcomes and promotes local cultures. But given the statue’s lack of environmental checks and its displacement of local populations, it is hard to see how this project fulfils these goals. The structure itself is not exactly a model of sustainable design. Some 5,000 tonnes of iron, 75,000 cubic metres of concrete, 5,700 tonnes of steel, and 22,500 tonnes of bronze sheets were used in its construction. Critics of the statue note that this emblem of Indian nationalism was built partly with Chinese labour and design, with the bronze sheeting subcontracted to a Chinese firm. The statue’s position next to the controversial Sardar Sarovar Dam is also telling. While chief minister of Gujarat from 2001 to 2014, Modi pushed for the dam’s construction despite the World Bank’s condemnation. He praised the dam’s completion in 2017 as a monument to India’s progress. Both the completion of the dam and the statue that celebrates it suggest that the BJP government is backing economic development over human rights and environmental protections. The statue’s inauguration comes only a month after the country closed the first nature reserve in India since 1972. Modi’s government has also come under sustained criticism for a series of pro-industry policies that have eroded conservation, forest, coastal and air pollution protections, and weakened minority land rights. India was recently ranked 177 out of 180 countries in the world for its environmental protection efforts. Despite this record, the United Nations’ Environmental Programme (UNEP) recently awarded Modi its highest environmental award. It made him a Champion of the Earth for his work on solar energy development and plastic reduction. The decision prompted a backlash in India, where many commentators are concerned by the BJP’s environmental record. Visitors to the statue will access it via a 5km boat ride. At the statue’s base, they can buy souvenirs and fast food, before taking a high-speed elevator to the observation deck. The observation deck will be situated in Patel’s head. From it, tourists will look out over the Sardar Sarovar Dam, as the accompanying commentary praises “united” India’s national development successes. But let’s not forget the environmental and minority protections that have been sacrificed to achieve these goals. This article was amended on November 7, 2018, to clarify the role of Chinese companies in the statue’s design and construction. Are renewables pushing up the cost of electricity? That’s the claim made by Alan Moran in an opinion piece for the Australian Financial Review this week. Moran, executive director of Regulation Economics and a former director at the Institute of Public Affairs, argues that increasing investment in renewables and particularly wind energy will cost consumers billions of dollars. The high operating costs and requirements for backup when the wind isn’t blowing are the problem, he argues. But the evidence actually suggests the opposite: wind energy is already competitive with fossil fuels, will reduce electricity prices for consumers, and will play a large role in reducing Australia’s greenhouse gas emissions. So, let’s go through Moran’s claims one by one. 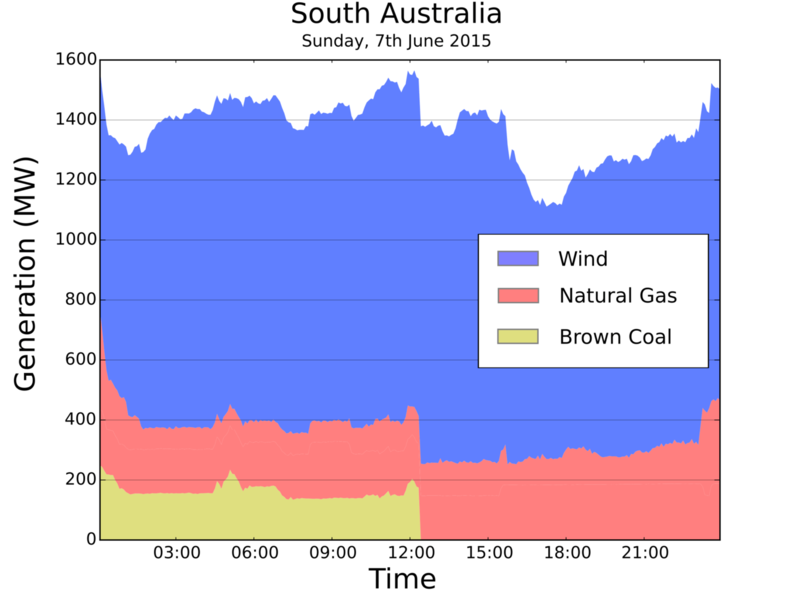 Generation by fuel type in South Australia on Sunday the 7th of June 2015. Operations at the Northern Power Station were shut down after an explosion at around midday. More broadly, redundant capacity is important in the entire electricity system (not just wind). All types of generation have planned and unplanned shortages. Unplanned outages are more challenging. If a whole generator goes offline, the system must return to normal within five minutes. This is often achieved with a “fast start” generator such as a gas turbine or hydro plant. These contingency plans must equal the loss of the largest generator in the system, usually coal. No technology is 100% reliable, as illustrated in the graph above. Wind is really quite predictable and reliable compared to coal. Claim: Wind turbine development has been improved over the past 20 years but is now approaching its theoretical maximum efficiency. It will never be remotely price competitive with conventional generators notwithstanding wishful thinking. As I’ve shown above, wind is already competitive with new-build coal (and gas) in Australia, and many other places around the world (including the United States). Carbon policy aside, some of the assets are seriously old and are going to be retired anyway. A new study from UNSW Australia looked at the best energy mix for generation. Even without a carbon price, the research found that the lowest cost mix in 2050 sources only 30% of electricity from gas, with the rest supplied by renewables. About half of the gas capacity is Open Cycle Gas Turbines (for peak demand) that supply very small quantities of energy. As I’ve written before on The Conversation, the government’s own modelling shows a net saving to consumers (and so does plenty of other analysis). The ACIL Allen analysis finds the target will cut power bills from 2021 onwards (by up to A$91 per year by 2030) and deliver a net saving to consumers. Claim: Energy only comprises 25 to 30 per cent of emissions and Australia’s renewable target might therefore reduce emissions by 4 to 5 per cent. According the Climate Change Authority’s review of the Renewable Energy Target (RET), the RET is projected to reduce Australia’s overall emissions by 58 million tonnes of CO2-equivalent. The Government’s latest estimate of Australia’s emissions reduction task between 2015 and 2020 is 421 million tonnes. So between 2015 and 2020 alone, the RET achieves at least 13% of the reduction task. Dylan McConnell is Research Fellow, Melbourne Energy Institute at University of Melbourne. The link below is to an interesting article that reports on the cost of electricity generation in Australia. The link below is to an article that looks at the cost of climate change for Melbourne in Victoria, Australia.